A physical and spiritual health crisis is brewing within the Black American community. Even Black American Muslims feel the effects of the urban condition and poverty, as well as materialism and a culture geared towards immediate gratification. What better way to feel gratified than eating? Even with our dietary restrictions and moral strictures, hypertension, diabetes, heart disease, and obesity are disproportionately taking younger and younger lives. Much of it comes from what we consume and how much we consume, in this culture of consumerism. In recent discussions at home, my husband and I have been discussing our relationship with the natural world, our relationship with food, and well-being food. He’s given a recent Khutbah on the Importance of Food and What Lies Beyond it. In it, he makes it clear that our relationship with food has spiritual dimensions. By eating healthy and incorporating daily activities, such as maintaining even a small garden or planting a tree, we can reconnect with ourselves and our natural world. Muslim organizations are beginning to embrace this concept. At the school where I teach, the principal required all upper school students to write an essay on “Going Green” for a scholarship contest held by a Muslim organization. I read all of my students’ papers and so many of them were inspiring. I became even more conscious of the everyday decisions I make that affect the environment and my health. The winning paper, written by a young man in the 10th grade, was an excellent essay on eating locally grown organic non-processed food. He made a striking case for how eating locally grown food is more beneficial for the environment than processed food. Processed food is grown with chemicals that seep into our water system, in addition to being packaged and shipped, requiring petroleum for the plastics that wrap it and fuel to move it. Our industrial food complex is reeking havoc on the environment, just as it is ruining the health of so many Americans. I’ve known several people my age who have suffered from Diabetes and Hypertension. And the dietary changes they have to make include reducing red meat and eating low-fat foods and fresh vegetables. You would think that obesity and diet related diseases would be the bastion of wealthy people who could afford to splurge on rich food. But it is not. The wealthy can afford healthy food much in the same way they can book vacations, go on retreats or hikes to rejuvenate both physically and spiritually. One of the first places we see inequality is in food access. Affluent neighborhoods have a plethora of food choices and with healthy restaurants. In gentrified neighborhoods you will always find a Wholefoods, Trader Joe’s, and your weekend Farmers Markets. In poorer neighborhoods, you will find sub-par produce, and often a lack of grocery stores. Farmers markets and the Mennonites don’t really make it deep into places like North Philly. Instead, you will find bodegas or corner stores full of highly processed junk food. But healthy eating, urban gardens, organic produce, and wholesome living are not just for tree hugging hippies or urban hipsters. While privileged members of our society have greater access, there are religious leaders and social justice activists who are fighting for urban renewal and healthy food access. The tradition of diet and health has long roots in religious revival movements. My mother grew up Seventh Day Adventist,. She recalls going to camps where they adhered to vegetarianism and kosher dietary laws. The Nation of Islam also emphasized healthy eating and moderations. I remember picking up a copy of the NOI publication, How to Eat to Live. Black American Orthodox Muslims also have a long tradition in diet, health, and wellness. In the 20th century, such as the Izzidine village, emphasized self sustainable rural communities based on agriculture. Many of those who moved back to the urban environment continued to develop urban gardens that fed the local community. Muslim leaders continue to emphasize health and wellness as duties because “our bodies have rights over us.” They encourage eating halal food, as well as eating in moderation for our spiritual well being. Tied to taking care of our bodies because it has rights over us is our role as vicegerent of this Earth. But sometimes in urban environments, it is hard to remember our vicegerency because we can’t see our link with nature and our food chain. 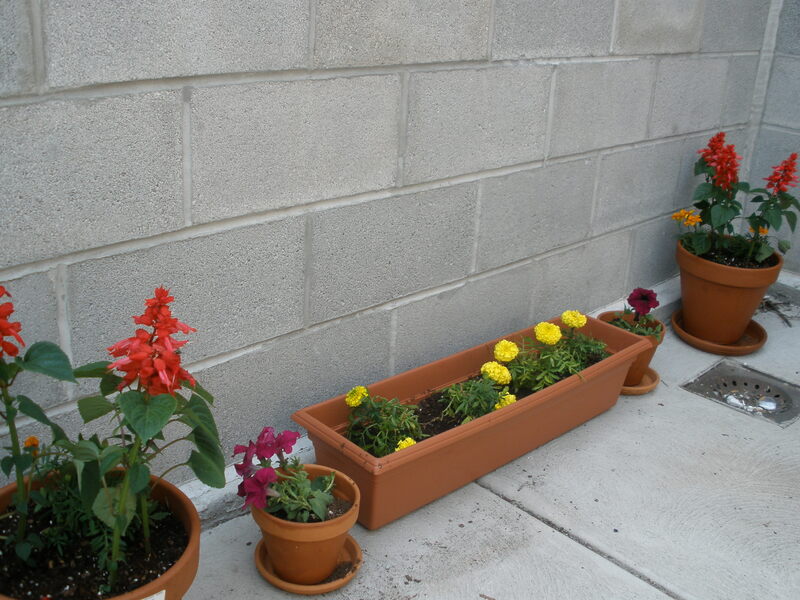 However, some people are looking to rejuvenate the city with flower and vegetable gardens. I’ve passed by gardening clubs where members grow fruits and vegetables on their small high yield plots. Some gardens are so productive that they help stock pantries of soup kitchens. 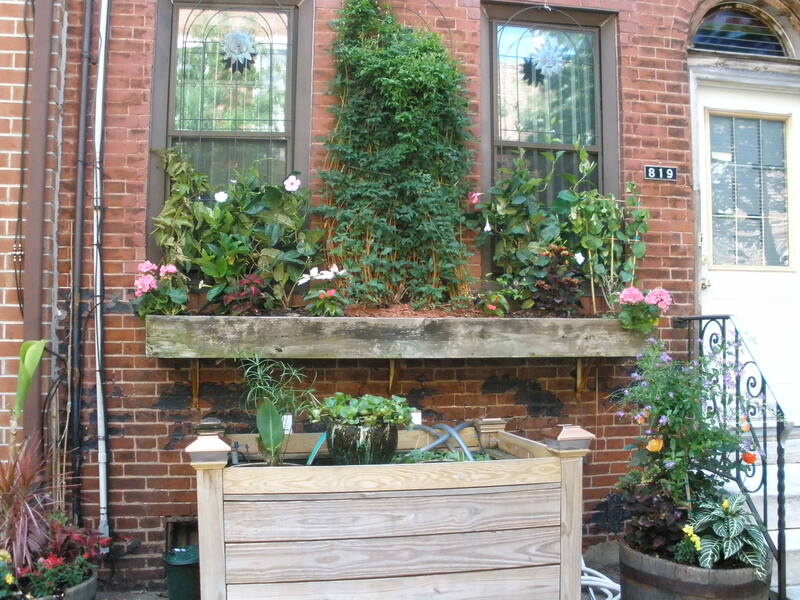 And many city dwellers are turning their backyards into produce centers. In fact, Urban gardening is about as hip walking spastic toy dogs. Not far from where we live is a communal garden full of hipsters who bring their own spades and shovels to reconnect with nature on weekends. Even I’ve begun gardening in our small patio backyard. I didn’t start in order to jump on the bandwagon. But rather to reconnect with the natural world, which seems light years away from South Philly. I also wanted to connect with my heritage, my mother’s rural roots in New Jersey. It wasn’t until the great migration that thousands of Black Americans migrated from the rural south to Northern cities. And my grandmother’s roots in Georgia. My grandmother maintained a vegetable garden, as well as my mother. While I haven’t started a vegetable garden yet, for over a year I talked about getting a house plant so that we’d have something green in our apartment. Every time my husband brought home flowers, I’d brighten up. Now he smiles when he finds me in the backyard toiling away. I’ve nursed some marigolds without potting them for over two weeks. With the three-day weekend, I had an opportunity to take my garden to the next level. So I dragged my husband, who’s always supportive of whatever endeavor I take on, through the Italian market, to Walmart, and the Urban Jungle store in search of the supplies I needed to create our own little back yard paradise. I woke up this morning to see if I killed any of those little plants. And with a sigh of relief I saw them bright and cherry. But later in the afternoon, I had to rescue my wilting Salvias from the prostrating heat. 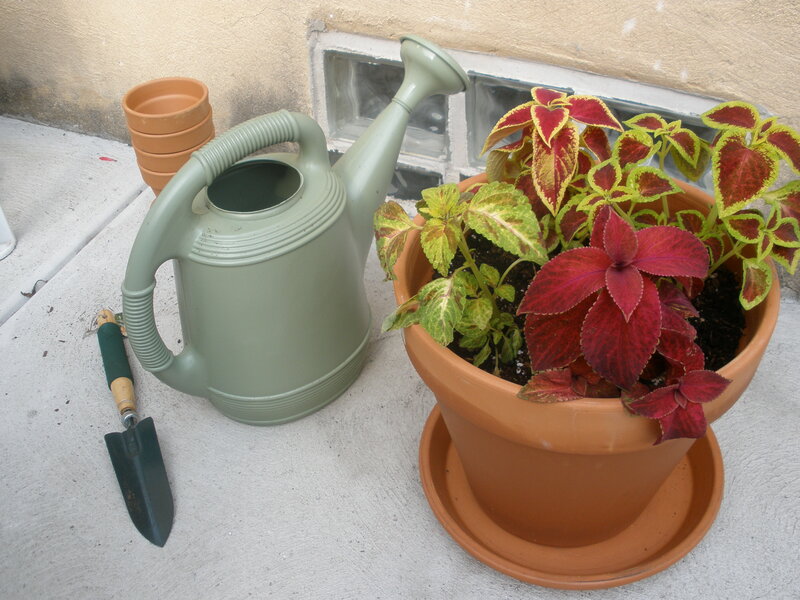 I really understood our relationship with nature as I saw the leaves begin to stretch out with life again and the stems stand up straight with pride just a half hour after my efforts at watering and adding more soil to my pots. I felt a bit of wonder as I saw a butterfly float into my backyard and dance around from flower to flower. Perhaps it may not have found its way to my patio had it not seen the flowers. Perhaps I could draw more butterflies. Better yet, I’m thinking I could hang a bird feeder as a next step. Recently I looked up the vegetables that are ideal to begin planting in June. I’m going to get my seeds and start. Perhaps this Fall, we can enjoy our first harvest. It’s a small step. But it goes a long way in helping me appreciate the difficult journey our food makes to our mouth. Our lifestyle has led to us being alienated from ourselves and disconnected with our natural world. Thus, we abuse our bodies with unhealthy food, our bodies atrophy from inactivity, and we are blocked from seeing the many beautiful signs of Allah through his creation. Having something alive and growing around us reminds us of Allah’s wonders, even if we can’t hike at Yosemite every weekend. Perhaps with my little garden I can be more mindful of Allah’s mercy and my “bismillah” before each meal will be said with more meaning and sincerity. Masha’Allah I can relate to this post in so many ways. After a very trying year- I’ve found that working in my yard has become a healing practice for me. Everyday I look forward to watering and planting-making dua as a work. I always find myself with a new project. Haha. I do benefit from living in a rural area now & love visiting local nurseries or spotting people selling tomatoes, veggies, flowers or fruit. It’s rewarding work. As a non Muslim, I still relate heavily with this post. The interesting thing to me is that Nature transends all religions and is universally recognised as having a relationship with spirituality. Lovely!!! As you know, I’m an avid gardener. This year, I tripled my vegetable garden! You may want to buy some of those “Topsy Turvey” hanging planters for tomatoes, peppers, and other vegetables. Also start an herb garden on your patio!